Yep, my Logitech G13 thumb switch broke mid game awhile ago so I decided to fix it and how I did it. Hopefully this will help somebody struggling with this problem. 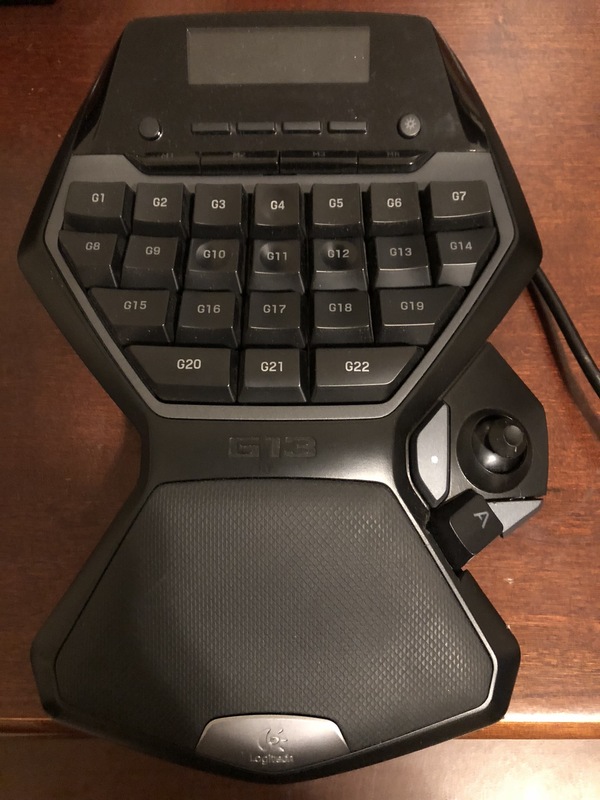 Since Logitech is no longer making the G13, the prices of new ones are well above what I’m was willing to spend, especially when it’s guaranteed to break. I suspect Logitech was taking a sizable loss warrantying this product due to thumb stick flaw and reason they discontinued it. 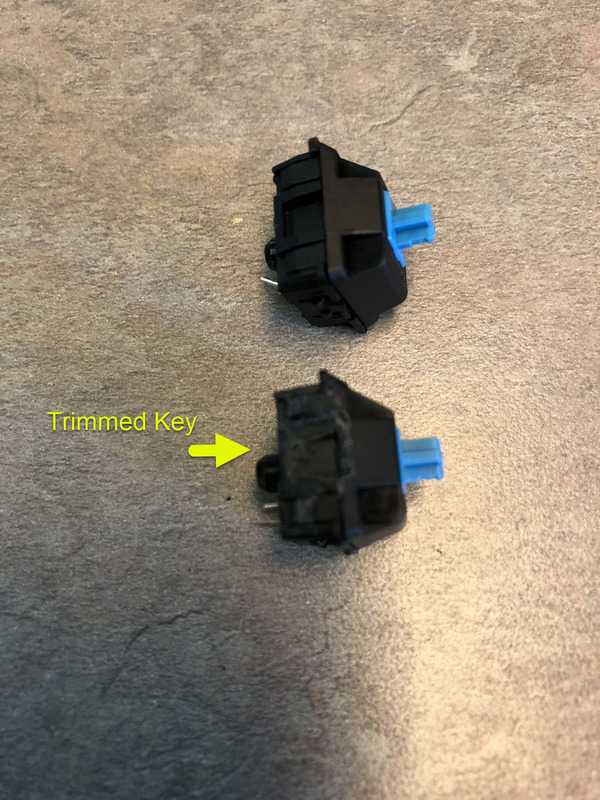 The thumb switch, G24 on the PCB/J33 in game is a tiny micro switch and the key mechanism that actuates it is a tiny plastic o-ring that breaks off. Additionally, my joystick failed (likely I caused it) during the original mod process so I had to re-open the pad and replace it. I’ve read that others have had their joysticks fail too. If you love your G13 like I do, don’t throw it away yet. It’s possible to repair it! 1. Don’t use super glue! That stuff gets on your fingers and then gets everywhere. Notice the white discoloration on the key-switch etc? That’s glue residue. 2. Replace the Joy stick along with the thumb stick key. You have it apart, might as well replace it. 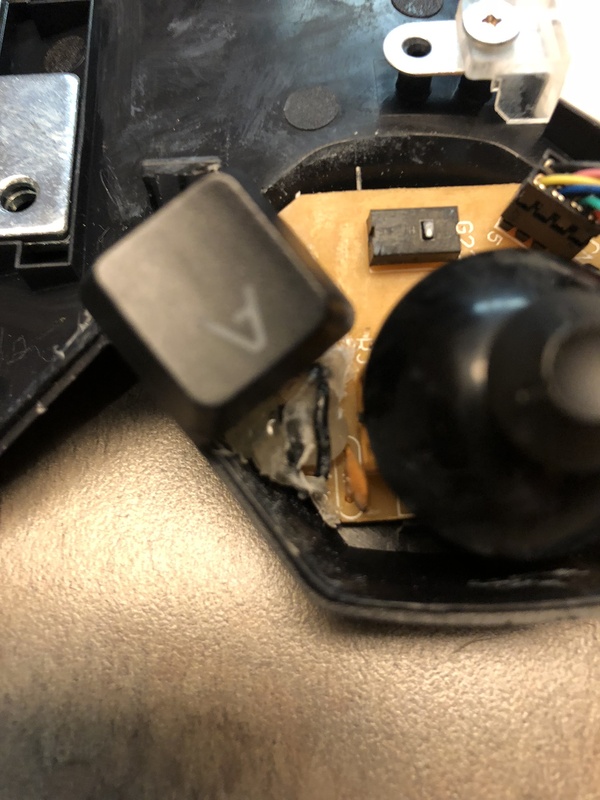 The fine dust that’s created during the filing process got into the inner workings of my joystick and killed it. Do yourself a favor and replace it after you’ve completed all the steps in installing the key switch and have completely blown out all the dust. Fix it once and be done with it. 3. Get the cheap PCB holder if you don’t have one, it makes this job a breeze, couldn’t imagine doing it without it. 2. Set of needle files. (Dremel tool would speed up process but it has to be variable speed, set to lowest speed) I didn’t use one. 12. Something to hold the PCB/s when you de-solder and re-solder the components. I used Elenco WEmake Rotational Circuit Board Clamp, and a second hand from a family member. 19. Drill and some drill bits. Variable speed recommend! 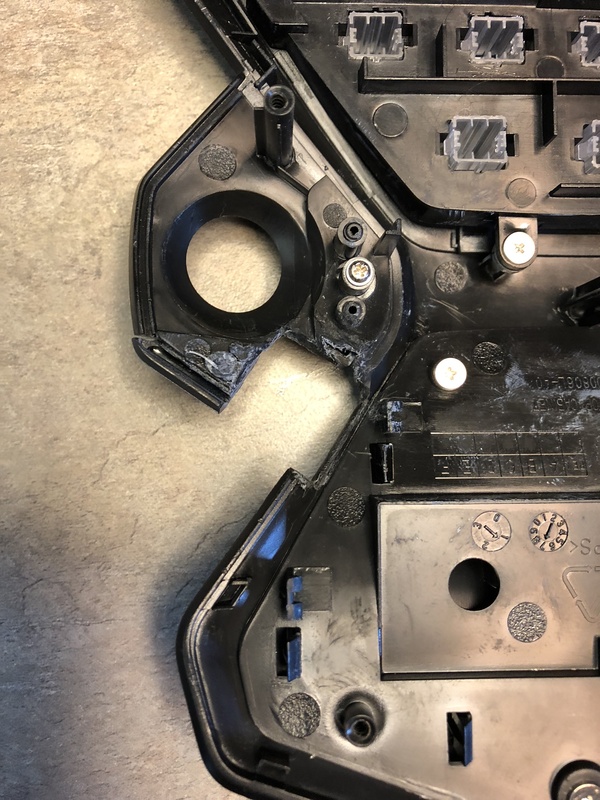 I also used a razor knife to delicately lift the pads just enough to remove the screws, but I didn’t completely remove the pads as I wanted at least some of the adhesive to remain intact. If you don’t know how to solder, I suggest you watch a couple how to video and practice before you attempt this repair. 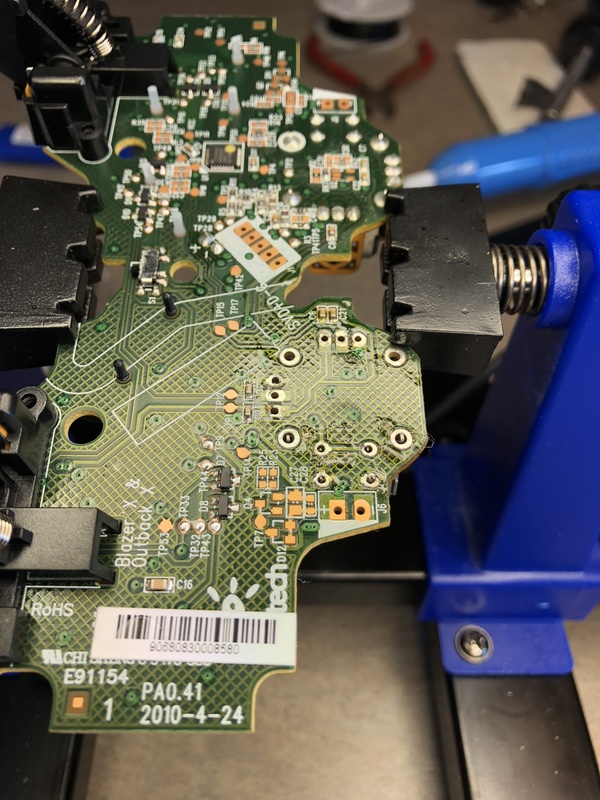 You can easily damage the PCB and/or new components, and fail to make proper solder connections. Also, your soldering iron tip needs to be approximate to the size of the pad/s you’re soldering. The PCB doesn’t have pass through rivets, the copper is essentially glued to the board. So when you’re soldering/de-soldering, you need a hot iron and to work quickly. Don’t linger on the pad for very long, otherwise you can easily release the glue that secures the copper to the board. Liquid Flux is required if you’re using solder wick. If the pad lifts, you can use epoxy once the solder connection is made to re-secure it to the board. The first thing you need to do is remove the wire connector attached to the PCB, next remove the two very fine phillips head screws. Underneath each screw is a black plastic stand-off remove them and keep the one that was next to the wire connector. You won’t be re-installing the one that was next to thumb switch. Now lift the PCB out of the bottom tray, turn the board over and un-solder the G24 micro switch and discard it. Before you put your iron to the board scrape off the thin translucent coating on the solder connections. This will improve heat transfer and reduce the time you spend on the pad. If you decide to replace the joystick (I recommend it) unsolder all but two of the larger leads. You want the joystick to remain in place while you’re filling the lid of the game pad. This saves time on the back end. The Cherry MX switches have very small tabs that stick out on the bottom and sides. You need to file these guys off and make the bottom and sides smooth. The bottom and the side that will be next to the edge of the tray are the important parts. This will allow the switch to sit flush. Take your time and don’t rush this! This is the critical piece of the this Mod! 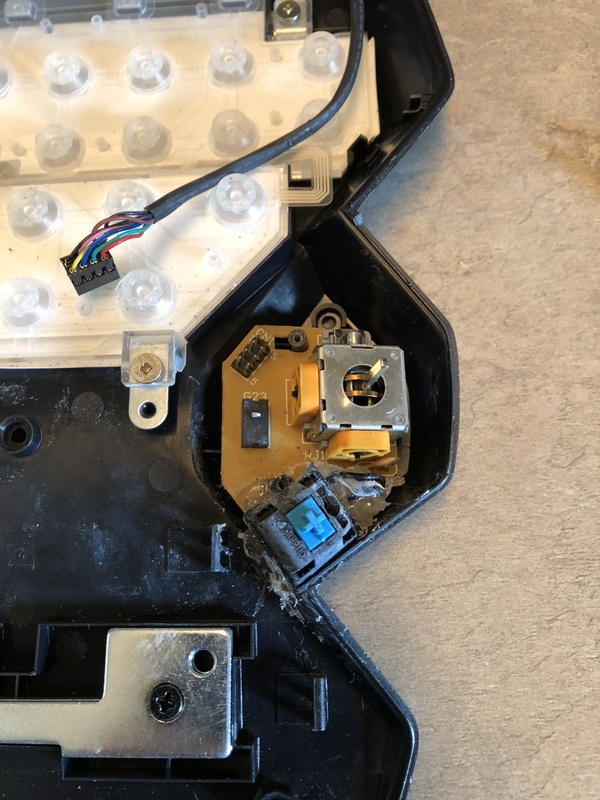 If you look at the picture, Logitech provided us a nice un-used hole on the board, I placed one of the wire connection leads of the switch thru it. The bottom of the Cherry switches has a round protuberance that will prevent it from sitting flush with the board. You have to drill a hole in the PCB for this round piece to fit in. I lathered black sharpie ink on the bottom of the switch then set it on the board to work out the approximate location of where to drill the hole. Start off with a small hole then work your way up in size. You don’t want to get too big because you can easily cut a wire trace on the back side of the board, depending on your solder ability that’s essentially game over. Caution: You need either a hand or variable speed drill. You can hurt yourself very easily attempting this with a regular one. Essentially what you’re trying to do is make the edge of the key switch rest flush against the edge of the keyboard tray. I had to take a small round file and finesse it’s shape to facilitate this process. If you look at the picture, you need to cut out a section of the PCB. I recommend placing some kind of mark on the switch that aligns with an adjoining mark on the PCB. This will help you to put the key switch back into right place after you cut the PCB. (Lesson Learned.) The cut-out in the PCB provides room to make the wire connections on the key switch. I used a small file to cut this notch out. Next, place the PCB back into the tray and key switch back into the PCB. Once you have the Key Switch oriented correctly (Flush with the side of the tray) hot glue it to the PCB. (Don’t Hot Glue the Switch or the PCB to the Tray Yet). This was a difficult part for me which involved a lot of trial and error. Hopefully, I’ll help you avoid some of my pitfalls. Looking at the picture provided you can basically see how I routed my wires. I used size 22 wire because that’s what I had on hand. If you can find anything smaller, possibly ribbon cable wiring I’d recommend it. Size 22 wire just fit into holes on the board. The thickness of the wires also made it difficult for the PCB to sit right inside the board tray. I had to trim the off a section of the tray’s stand offs to make it work. I didn’t try routing the wires along the top because I was afraid they’d obstruct and interfere with the joystick hat. Next, solder the wires to the PCB, I soldered the wires to the PCB first then made the connections at the switch. What you’re trying to do here is to get the wire oriented just right to allow the PCB to sit correctly in the tray, that also allows the key switch to match it’s original orientation. Don’t hot glue the wire etc until this is perfect. 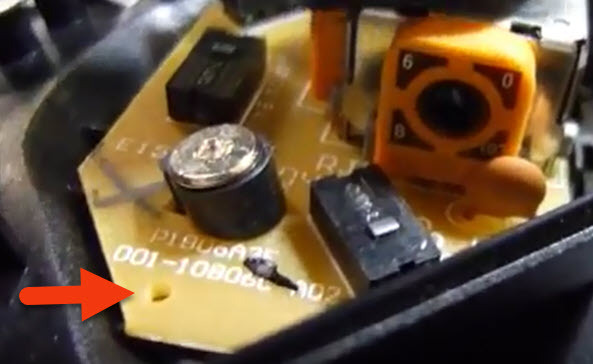 When your orienting your wires, make sure the bend connections at the original micro switch locations aren’t too high, to prevent them from interfering with the new key switch hat. If you get pissed of like I did walk away from it and cool off. This part has to be perfect, Logitech didn’t give us a lot of wiggle room here. You got it right when the board sits perfectly like it did prior to installing the wires, and the wires aren’t forcing the board to raise up etc. Once you’re happy with it screw the PCB back to the try and place a small bead of hot glue to hole the switch & PCB to the tray. You don’t want the PCB to shift/float during the Lid cutting process coming next. Step 8. Remove Original Thumb switch key. On the game pad lid, remove the single screw that secures the original thumb key actuation mechanism. Half of this switch will be cut later, so after you remove it set it aside. Step 9. Cut and Trim the Key Switch Location. If you look at the picture you can see the large section of the lid I had to cut out. I used a hand file to cut the plastic. If you decide to use a dremel, I’d probably try a cutting wheel set on low speed while wearing safety glasses. Place your key cap on the new key switch you installed and start cutting your lid. You’re going to probably want to punch kittens during this process but keep at it. Keep trimming until the key switch actuates freely. At some point during this process your will need to snap the lid securely to the tray to make sure the cut is adequate. When you think you have enough off, take a little bit more, because when you screw it together it the switch will miraculously not work. This is step that likely killed my original joystick. You’re going to have dust particles everywhere by the time to get the lid to fit correctly. After I took the PCB out to replace the joystick, I still had to re-file in a couple places. Blowout the game pad, remove all duct particles, break out your Q-tips and clean it to perfection. 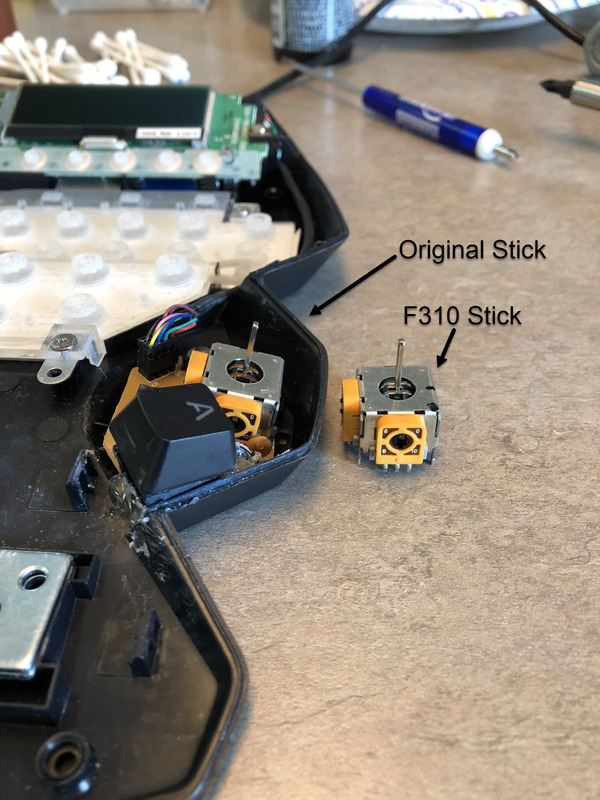 I scrounged the internet for any information I could find about the joystick inside the G13, my best guess it’s a proprietary item manufactured for Logitech. I saw a video of a somebody that modded a F310 and it looked like a match. It’s a dead on replacement. So for $20 you end up with two joysticks. The F310 is held together with a couple screws, remove them and the game pad falls apart in your hand, easy business. Two or three screws secure the PCB to the game pad, remove them and pull out the PCB. 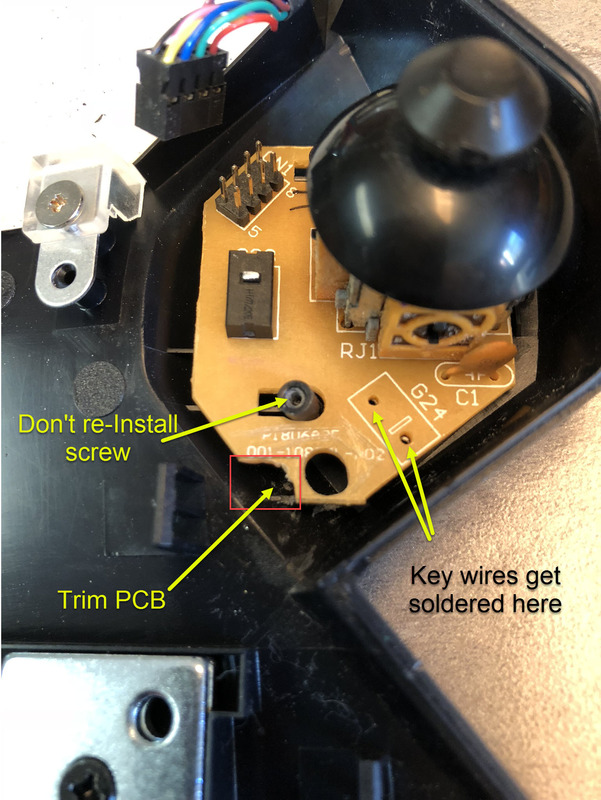 Remove the Joystick from the PCB. Seriously, purchase a new F310, installing a used joystick into your G13 is a waste of time. 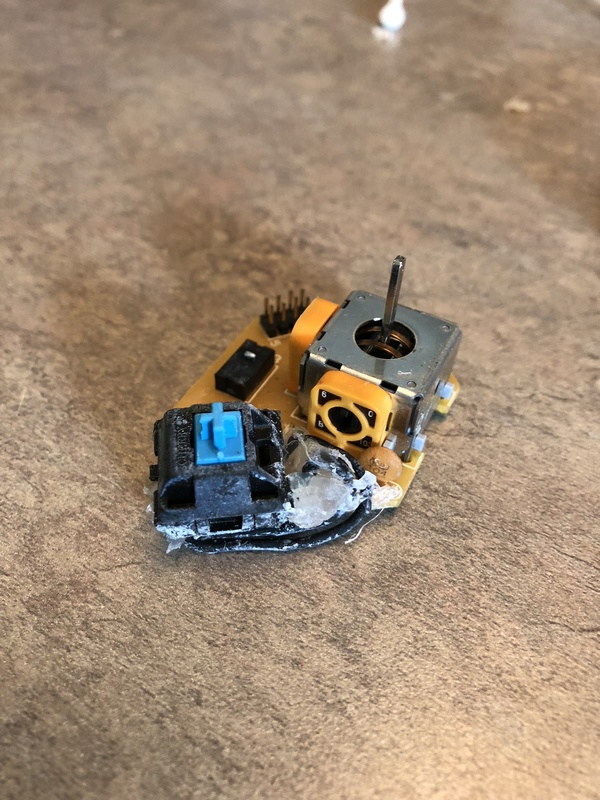 I highly recommend you replace your joystick! Man you don’t want to be going back into this thing like I had to. Remove the PCB for hopefully the last time and un-solder the two joints. Put in the new joystick and solder it into place. Make sure you clean the flux residue off the PCB with alcohol, use only a little bit of it at a time. Alcohol works as a release agent for hot glue so don’t get ridiculous with it. Next re-install the PCB, screw it down, and place the thumb cap on. Now test fit your lid and make sure it installs perfectly. Make sure the Key switch actuates properly. Remove the lid and place a small bead of hot glue to secure the PCB to the tray. 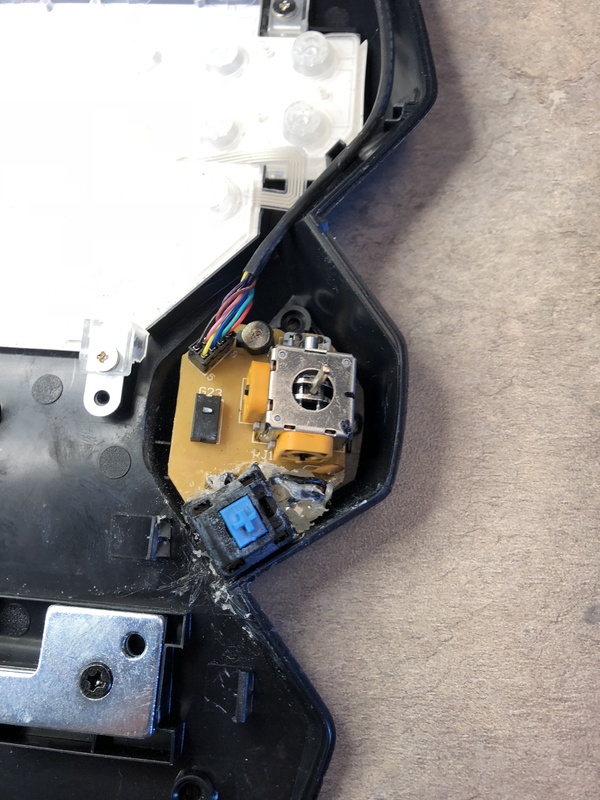 Lastly, make sure you reconnected the wires to the PCB, install the lid and re-install all six screws you removed at the start. Guys I did this from memory so there maybe a few things I might’ve forgotten. I finished the joystick replacement last night. I plugged the G13 back into the Xim4 and it works flawlessly again! I hope this helps some folks out there. Good Luck with your project. I think your asking if the Dualshock 3, 4, or Xbox joysticks will work in the G13. I don't think they will unless you're willing to overcome some additional challenges, they're definitely not drop in replacements. 1. I'm not sure if the resistance of the potentiometers in the above joysticks are compatible with the G13. They might be, just not sure. 2. I have some Xbox joysticks from another project, the form factor is smaller. You'd have to use wires to make the electrical connections. This creates another problem of not having the stick firmly connected to the PCB. 3. The shaft length of these joysticks are shorter, you'd have to find a way to either extend the shafts or raise the switch off of the circuit board so the joystick "hat" doesn't contact the board internally. 4. The original Logitech joystick "hat" wouldn't easily connect to these joysticks, you'd have to creatively solve that problem.